Christendom: As is the case in the political field, there have always been differing views on appropriate Church discipline and governance. These views range from the extremely liberal to very traditional. Most of the opinions, which today fall under the category of "liberalism", are actually heterodox or heretical and of little value in most Catholic discussions. Because of this element "within" the Church and the overall shift that occurred around the time of the Second Vatican Council, the classic battle between liberals and conservatives has undergone a deceptive change in terminology. Traditionalist: One who challenges the novel practices and teachings of Catholics (including bishops and priests) which appear to contradict the prior teaching of the Church. A traditionalist questions the prudence of new pastoral approaches and holds the belief that those things generally deemed objectively good or evil several decades ago remain so today. Conservative: One who upholds and defends the current policies and positions of the Church hierarchy regardless of their novelty. A "conservative" extends the definitions of "infallibility" and "Magisterium" to include most every action and speech of the Pope and those Cardinals around him, but may exclude those Cardinals and bishops outside of Rome. A "conservative's" opinion is also subject to change depending on the current actions of the Holy Father. "Conservative" will be used it in quotation marks to avoid the misleading connotation of being diametrically opposed to liberalism or on the far right of the spectrum. Also since there only exists a desire to "conserve" only those traditions and practices of the past deemed appropriate at any given time by the present Pope. The quotation marks will also ensure a proper dissociation between the actual conservatives active prior to and during Vatican II (Ottaviani, Lefebvre, Fenton, etcetera). Both traditionalists and "conservatives" acknowledge the existence of problems in the Church but disagree as to their nature, extent, causes and remedies. "Conservatives" see it as an "illness" — an incidental problem like a gangrene limb. In the English-speaking world, this problem may be limited to the actions of certain American bishops. "Conservatives" see the novelties of Vatican II and the New Mass as natural and acceptable developments in the course of the Church, but take issue with those seeking to expand upon those novelties, or take them to their next logical progression. They see the crisis in the Church as a societal issue that would have happened regardless of what actions the Church leadership had taken. Their solution is to return to Vatican II and embark on another attempt to "renew" the Church. Traditionalists see the illness as a widespread cancer affecting the whole body put most particularly and critically the heart. They question the prudence of making significant changes in the Mass and the Church's pastoral orientation. They attribute the destruction to liberal and Modernist ideals given a certain degree of acceptability once the Church decided to stop fighting them with extreme vigilance. They see the Church leadership as sharing in the responsibility for the crisis due to its governance (or lack thereof). Their solution is not another attempt at a reform that may be "more in line with the 'spirit' of Vatican II" (shudder), but a return to the practices and beliefs of the Church that sustained it for hundreds of years prior. 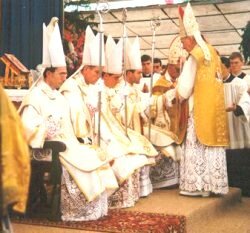 Archbishop Marcel Lefebvre consecrates four bishops "without pontifical mandate". Two days later, all five "incurred the grave penalty of excommunication"
While not in agreement on many issues, traditionalists and "conservatives" have typically enjoyed some degree of coexistence. "Conservatives" attacked heretics posing as Catholics in American churches and traditionalists focused on dangerous trends in the upper Church hierarchy. Unfortunately, it is becoming increasingly popular for "conservatives" to condemn traditionalists as "Schismatics" and guilty of "excommunication". Be it on the Internet, in periodicals, during speeches or on radio programs, traditionalism is being vilified as never before. This essay concerns itself with the attacks of those "conservatives" who have taken it upon themselves to condemn those who fall to the right of their views. It is questionable whether the proper functions of Catholics is to hunt down, "expose" and condemn Catholics they suspect of undue rigidity, disobedience or "material schism"; especially while giving support to a Vatican ecumenical campaign which addresses heretics and actual Schismatics as "separated brethren", Jews as "people of the covenant" and Muslims as "people of God". This is part of the overall contradiction (or inconsistency) that permeates the "conservative" mentality. Cloaked in a pledged loyalty to all things "whatsoever" emanating from the Holy See, many "conservatives" will go beyond the measures taken by the Church leaders, or even disagree with their actual positions. The Hawaii "excommunications" were an obvious example but others can be seen. "Conservatives" denounce as "Schismatic" all those who set foot in SSPX chapels while the Vatican embraces the Schismatics in China. "Conservatives" deny any significant change at the Second Vatican Council while the Pope celebrates the enormity and impact of the changes. "Conservatives" seek the conversion of the Eastern "Orthodox" while the Vatican promises not to "proselytize" them. "Conservatives" deride American bishops while the Pope appoints and promotes the same ones. Much ink has been spilled (or whatever the electronic equivalent is) in these increasing attempts to condemn traditionalists, with some polemics requiring hundreds of pages to make their point (if traditionalism is so clearly evil and harmful to the Church, why are such lengths necessary?). What follows is a brief essay addressing the most common objections of traditionalism. As a disclaimer (which will certainly be ignored), I am neither attacking nor defending any particular individual. I will discuss a number of objections which vary in substance and degree, but I am not asserting that all "conservatives" hold each of these positions; just as I don't presume to express the views of every traditionalist in my defense. "Traditionalists criticize the Church leaders, particularly the Pope. These criticisms show disloyalty and are only to be done by qualified theologians in rare circumstances." Why would traditionalists waste so much time discussing Papal actions out of simple malice towards the Supreme Pontiff? Traditionalists are Catholics who are very concerned about the state of the Church and are forced, out of charity, to make those concerns known. There should be no doubt that those who offer proper criticism show an even deeper love than those who remain in unquestioning silence. "Peter has no need of our lies or flattery. Those who blindly and indiscriminately defend every decision of the supreme Pontiff are the very ones who do most to undermine the authority of the Holy See — they destroy instead of strengthening its foundations." Ever since the pronouncement of Papal Infallibility at the First Vatican Council, there has existed to some degree a false impression that the Pope enjoys a high level of perfection and is protected from most errors — not just in matters faith and morals but all words and actions. Such a view is not Catholic and is dangerously close to the worship of a man (papolatry), a violation of the First Commandment. Infallibility is defined within very precise limits. Not every Pope enjoys an aura of infallibility or is generally protected from imprudence — just ask one of the sons of Pope Alexander VI. "It is in no sense doctrinally false that a Pope, as a private doctor, and much more bishops, when not teaching formally, may err, as we find they did err in the fourth century." The Supreme Pontiff is indeed deserving of the benefit of the doubt and his teaching deserving of "internal assent" (except in cases where there is nothing towards which to assent or an apparent contradiction with previous teaching). Although, this assent has been lacking in the Church since the 1960's (especially in America), to respond with an insistence of papal perfection is an extreme and dangerous overreaction. Although he was "Prince of the Apostles" and the head of the Church, Peter was not Christ. More scriptural verses are devoted to Peter's mistakes and imprudence than those of any other apostle. From his denials of Christ to his treatment of Gentiles, the first Pope was shown as a man with human weaknesses who was by no means perfect or deserving of "blind obedience". Some "conservatives" are fine with the existence of the criticisms but not with the perceived tone. Examples of previous saints (e.g. St. Catherine of Siena) are given to demonstrate the "proper" and "respectful" way to question authorities. First of all, a simple disagreement over communication techniques hardly accounts for the vast difference between loyalty and disobedience, or Catholic and Schismatic. Secondly, when situations turn dire, language must follow. Traditionalists are not taking issue with a single isolated incident in an otherwise strong and impressive Church. This is not the time for a simple reminder or request for clarification on a minor issue. It has long since escalated to full-scale alarm. The Church has gone through such overwhelming devastation over the past thirty-five years, it's a wonder anyone can react otherwise. Strong affirmations of Catholic truths and unambiguous criticisms of dissent are necessary in a time of confusion and ruin. "Traditionalists do not 'trust' their leaders and assume the worst." "Conservatives" compare traditionalists to the apostles who were disturbed by Christ's sleeping in the boat while the waters raged around them. I don't think the analogy applies. Again, Peter is not Christ and while "conservatives" may find it morally acceptable to remain silent, "trusting" that it is all part of God's Divine Plan, most Catholics are unable to calmly witness the Bride of Christ subject to such abuse. History is full of "defenders of the Faith" who were unwilling to see the Church afflicted in the smallest of ways ("small" at least by today's standards). Just because the gates of hell cannot prevail doesn't mean the attack on souls being carried out in the meantime should be passively ignored in a misguided act of faith. For what is a Catholic to do when heretics like Hans Kung are allowed to publish lies with impunity? When globalists and mass abortionists like Gorbachev are treated as guests of honor at the Vatican? When Schismatic groups, heretical sects and false religions are treated as on a similar level as the One Holy Catholic and Apostolic Church? When bishops who deny the necessity of conversion for salvation (Walter Kasper) and advocate the Church's assistance of women procuring abortions (Karl Lehmann) are rewarded with Cardinal birettas? When traditional bishops and priests are subjected to extreme and disproportional persecution while heretics exercise great power and influence? When Our Holy Father flatters the undeniably evil Chinese government as an institution whose objectives are "not in opposition" to the Catholic Church? Of what sort of "trust" are these activities deserving? What is the proper Catholic response? What would St. Paul have done? Indefectibility is not a promise of wonderful times in the course of Christendom. The Arian heresy was certainly no Golden Age for the Church. As St. Jerome wrote, the whole world "awoke with a groan to find itself Arian," yet the Church did not defect. The Faith was maintained primarily by the laity and led by a few courageous individuals when it appeared the majority of priests and bishops had fallen into heresy. Throughout history, there have been numerous corrupt Popes, Cardinals, bishops and priests but the Church has marched on, emerging from each trial stronger than before. While "conservatives" may be content to passively wait around for the next triumph of the Church, some Catholics set their sights a little higher and are concerned about the loss of souls that could be avoided in the meantime. Also, such a criticism of the "trust" of traditionalists is more than a little disingenuous. It represents the most traditional of "conservative" mentalities — an implicit admission that all these problems may exist but we should silently sit back and watch those chosen to run the Church do so as they see fit. To be consistent, "conservatives" would have to withdraw their attacks on American Cardinals who, by virtue of their office, should be deserving of similar "trust". This objection also shows a lack of "trust" for the previous Popes and their efforts as recently as the early part of the 20th century. Again, some "conservatives" claim all current Papal actions to be completely consistent with his predecessors and Vatican II completely in line with the history of the Church, while the Pope and Cardinals claim and celebrate the opposite. Why would Pope St. Pius X devote so much time and energy to combating and rooting out Modernism if he did not clearly see its power and ability to infiltrate the highest levels of the Church? Many people laughed at his "crusade" and thought he was overreacting, but history has long since vindicated the prophetic nature of his words. 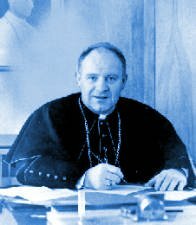 Why were many priests and theologians, who would later rise to influential positions in the Church, under serious investigation for Modernism in the 1950's? Is perfect wisdom and orthodoxy guaranteed by position? Again, of what sort of "trust" is deserving here? "Traditionalists defy the Magisterium of the Church." Despite his shortcomings, Savonarola was one of the few to speak out against the worldliness, excesses and humanism growing among the clergy and especially the Pope: "In these days, prelates and preachers are chained to the earth by the love of earthly things. The care of souls is no longer their concern. They are content with the receipt of revenue. The preachers preach to please princes and to be praised by them. They have done worse. They have not only destroyed the Church of God. They have built up a new Church after their own patter. Go to Rome and see! ... Dost thou not know what I would tell thee! What doest thou, O Lord! Arise, and come to deliver thy Church from the hands of devils, from the hands of tyrants, from the hands of iniquitous prelates." Not so! The Magisterium is not everything a Pope or Cardinal may decide to do (like hold an ecumenical seance) but the official teaching authority of the Church, whether Ordinary or Extraordinary. As with infallibility, "conservatives" extend the meaning of Magisterium to encompass the actions of anyone in the upper hierarchy of the Church or with current residence in the Vatican. Traditionalists have called into question (not defied or rejected) some recent teachings of the Ordinary Magisterium because of their apparent contradiction with previous teaching. This is not a preference or an overly-arrogant use of "private judgment". They maintain the attitude that what was true for their parents and grandparents is just as true for them. They refuse to share in the optimism of new ideas and techniques promising to "renew" the Church. Such naive optimism may have been excusable forty years ago — it's not any more. Suspicion towards non-infallible teachings of the Ordinary Magisterium will be addressed more below, but it is founded in a belief of absolutes in the objective order. Just because matters of Church discipline are not on the same level as solemn moral pronouncements, doesn't mean the arguments which support them cease to apply. In fact, when communion in the hand and "altar girls" were forbidden by Rome, "conservatives" led the crusade against the dissenters and were the first to proclaim their evils. When Rome caved into the pressure and deemed each aberration acceptable, what was once so clearly imprudent to "conservatives" was suddenly "OK". Granted this is "only" a disciplinary matter, but a Catholic attitude is one that holds novelty and change suspect no matter what the justification. If this strange sort of "trust" leads to a blind complacency which renders one incapable of recognizing error once it has bored its way into the heart of the Church, it should be seen as an accursed vice. If "integrism" is used to describe those people who protect the Church from dangerous novelties with the zeal encouraged by St. Pius X, how can it become anything other than a badge of honor? "Traditionalists view the documents and encyclicals of recent years as questionable or different than those of previous Church leaders." It doesn't take a theology degree to recognize that the language of documents since Vatican II is decidedly different than those of previous years. What once was clear and precise, giving little room for alternative interpretations is now vague and questionable. In previous times, a statement that apparently contradicted previous teaching would, out of obligation, contain a clarification of how it is to be reconciled with what was previously taught. This is no longer the case and any inconsistencies are either ignored or the previous teaching is said to "no longer apply". Traditionalists ask the question "why?". Why are Catholics owed no explanation of why a teaching is being completely reversed before their eyes? And why are "conservatives" the only ones defending these documents? Why don't the actual authors in the hierarchy provide clarifications? While many "conservatives" are quick to defend some of the novel language Ut Unum Sint or Dominus Iesus as perfectly orthodox, such defenses have not been regular or forthcoming from the Vatican. And (as with the Novus Ordo) since when does something "perfectly orthodox" even need a defense? The objection comes that Catholics should trust the language as orthodox and assume any apparent contradiction is just a deficiency in their own untrained understanding rather than in the document. But if that's the case, what is the point of the document in the first place, if not to clearly instruct? These documents are not written for "elite" theologians but for all Catholics. These documents used to be in clear, unambiguous language which took no chances when it came to possible misunderstandings. Theological degrees and "conservative" defenders were not needed to discover their "proper" meaning, and they should not be today. The very fact that modern encyclicals leave any room for intelligent, faithful individuals to debate the meaning is, in itself, a serious criticism. "Traditionalists view Vatican II as a significant change in the orientation of the Church." "We have the impression that through some cracks in the wall the smoke of Satan has entered the temple of God: . . . doubt, uncertainty, questioning, dissatisfaction, confrontation . . . We thought that after the Council a day of sunshine would have dawned for the history of the Church. What dawned, instead, was a day of clouds and storms, of darkness, of searching and uncertainties." The claim that Vatican II represented a very slight or insignificant change is the first of the two very mysterious objections addressed in this essay (the other being the New Rite of the Mass wasn't much different than its predecessor). Mysterious because these were the same claims made by everyone (liberal or conservative) when the changes were going on. There was little disagreement as to the extent of such changes, just the prudence of making them. Whether or not the changes have been beneficial is debatable, but whether or not a change in orientation has taken place within the Catholic Church is a clear, established fact admitted by all. "Traditionalists reject the infallibility of the Vatican II documents which are automatically infallible, being pronounced by an ecumenical council." Ecumenical councils have typically been called to address doctrinal issues and make solemn definitions. Vatican II was, from the start, billed as a "pastoral" (as opposed to "doctrinal" or "dogmatic") council. This was repeated to the bishops on several occasions when concern was raised over the orthodoxy and authority of some of the documents. The nature of such "apparent contrasts" is debatable, as are the appropriate methods employed for discussion and clarification, but all investigation on the matter should not cease to a halt due to an insistence on infallibility that never existed. To do so would reward those looking to take advantage of this imaginary infallibility "gray area" by giving novel ideas the authority of an ecumenical council. What could be more clear? What is reserved for certain individual sentences cannot be generally applied to an entire collection of documents. Non-definitive statements cannot inadvertently be sealed with infallibility because they happen during a council. No matter how many times Vatican II is praised by present bishops and even the Pope, infallibility cannot be applied retroactively. If it did not exist at the time, it cannot be claimed now or in the future. "Traditionalists view the current crisis of the Church that has occurred since the 60's as somehow 'caused' by Vatican II or the New Mass or the actions of the Church Leaders. That is ridiculous and similar to claiming Humanae Vitae 'caused' the modern crisis." "The Holy Ghost was not promised to the successors of Peter that by His revelation they might disclose new doctrine, but that by His help they might guard sacredly the revelation transmitted through the apostles and the deposit of the Faith, and might faithfully set it forth." This comes closer to the heart of the traditionalist position. Traditionalists tend to place the "blame" for many modern issues on the Vatican Council and the New Mass (also Church governance which could be seen as an extension of conciliar-style "ecumenism" and "collegiality"). "Conservatives" revel in the claim that since such a "cause-effect" relationship cannot be "proven", assigning any blame or trying to reasonably demonstrate how one could lead to the other is completely unreasonable. They cite the basic principle of scientific research that correlation does not demonstrate causation. Unfortunately for "conservatives", such exact causation cannot be determined outside experimental settings and thus has little bearing on examinations of history. Political scientists will always debate whether America came out of the Great Depression due to the "New Deal" or World War II, but neither can be scientifically "proven" as the cause. Because one cause cannot be proven, another cannot be discounted — especially one with reasonable logical support. Traditionalists make a compelling case for the role the "renewal" of Vatican II has played in the modern crisis. To discount such an argument due to the failure of establishing an impossible "proof" is intellectually dishonest. 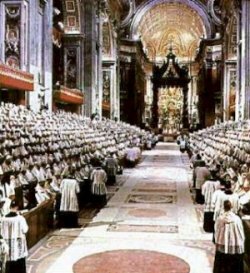 Traditionalists believe the Second Vatican Council to be harmful to the Church. As with criticisms of the Pope, this does not represent a denial of the Church's indefectibility. Just because an ecumenical council is called, does not guarantee it will succeed or be good for the Church. "If one of the devils in C.S. Lewis' The Screwtape Letters had been entrusted with the ruin of the liturgy, he could not have done it better." "In the case of practical, as distinguished from theoretical, authority, which refers, of course, to the ordinances of the Pope, the protection of the Holy Spirit is not promised in the same way. Ordinances can be unfortunate, ill-conceived, even disastrous, and there have been many such in the history of the Church. Here Roma locuta, causa finita does not hold. The faithful are not obliged to regard all ordinances as good and desirable. They can regret them and pray that they will be taken back; indeed, they can work, with all due respect for the pope, for their elimination." The alternate "conservative" theory of causation (that the current situation would have happened anyway due to unavoidable changes in social climate) is possible but seems unlikely for several reasons. Anecdotally, we've seen that non-Latin Catholic Rites and Eastern Schismatic churches did not see the same drop-offs and mass exodus. We've also seen the popularity of Islam explode in Western civilization, especially in Great Britain and the United States. One would expect a debilitating societal condition to afflict different "religious groups" equally (or at least somewhat proportionally). "If it now seems that salvation can be obtained in other religions, why remain Catholic?" 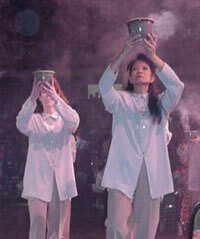 "If anyone can participate "actively" in the liturgy, why be a priest?" "Why is the Mass now very similar (in prayers, music, architecture) to the heretical ones previously condemned?" "If the Mass and the Church can change this much, why can't it change further to whatever my particular cause is?" "If that which was formerly condemned is now acceptable and the 'old' Church was mistaken or 'out of touch', how do we know the current Church isn't the same way, and will be judged as 'out of touch' at some future point." All understandable concerns — concerns which had no real basis in pre-conciliar days. They do now. Which brings us to the much heralded "Spirit of Vatican II" which is used to justify any and every aberration or heresy. Regardless of whether you see this as an abuse of the Council or the result of the logical progression it unleashed (I tend to favor the latter), such novelties would have no excuse were it not for the Council, and the laity would be less likely to accept them. Novelties on a far smaller scale went on before the Council but received limited support and were clearly seen for what they were. 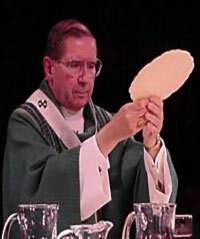 The Archdiocese of Seattle went through a disastrous time in the 1980's under Archbishop Raymond Hunthausen. Everything from "altar girls" to lay-run "liturgies" to pagan architecture to invalid sacramental matter was justified by conformance to the elusive "spirit of Vatican II". What if no such Council could be used for such abuse? They may have found another excuse but it would be much less likely to succeed and certainly less widespread. When Modernism and liberalism were emphatically condemned from the highest levels of the Church, when priests were required to take anti-Modernist oaths, when diocesan councils were encouraged to root out these errors, such a thing could never be justified nor carried out. When the fight against these forces turned into an implicit (or explicit) acceptance and such outward changes could be seen by Catholics every week, the Catholic Church became fertile ground for a revolution. When confusion reigns, those things that would normally cause mass protest are accepted. "...I sincerely hold that the doctrine of faith was handed down to us from the apostles through the orthodox Fathers in exactly the same meaning and always in the same purport. Therefore, I entirely reject the heretical misrepresentation that dogmas evolve and change from one meaning to another different from the one which the Church held previously." All this is defended as the necessary cost of the "renewal". No matter how enthusiastic the Pope is about the current Church and Vatican II, no "renewal" is happening. The evidence of this fantastical "Springtime" is nowhere to be found, except in those small pockets of grace which find the faithful rediscovering the traditional teachings, practices and rites of the Catholic Faith. With regards to the "Humanae Vitae" argument, equating a significant change in the orientation of the Church towards the world (accompanied by a change in worship experienced every week by every member of the Latin Rite) with a single encyclical which upholds Catholic teaching, and discounting the possibility for either to significantly effect the Church is, at best, careless. It seems that "conservative" Catholics are frantically looking for some explanation of what's going on, convinced it couldn't be the Council or anything the Church leaders have done. Why not? Some have gone so far as to claim that most every modern problem in the Church from low Mass attendance to a lack of vocations was "caused" by dissension from Humanae Vitae. (14) And that through a sort of "radiation" theory, the "plague" of dissent has brought the Church to its knees and driven away priests and converts, leaving the Pope and bishops absolutely helpless. Again, if you'll believe this, why discount the possibly of significant wide scale changes made by the Church itself having some negative effects? "Conservatives" are faced with another problem when they start blaming the current crisis on certain dissenting bishops and priests who spread heresy, dissent and scandal. If they are to blame, so is their leader. Who is the one in charge of governing the bishops and priests? Who is responsible for keeping them in line? If local policemen start a riot, you can bet the police chief and mayor will be held accountable. When Palestinian suicide bombers attack Israel, Arafat will certainly be held to blame. When a company is facing bankruptcy and losses, the CEO needs to answer for it. Pick any organizational analogy you like — teachers, parents, sports teams, schools, businesses, organizations, societies — the result is the same. The state of a household in ruin has something to do with its head — whether through misguided actions or the lack of appropriate response. So any attack against a liberal Cardinal or dissident bishop is an implication of Our Holy Father. Who has the power to reprimand heretics? Even if you excuse the Pope as "too busy" or claim he "has his hands tied", who has the power to assign bishops? Why has the Pope made bishops out of Thomas Gumbleton and Matthew Clark? Why are Francis George and Roger Mahony named Cardinals and electors of the Pope? You can only pretend for so long that the Pope is oblivious to "what's really going on". John Paul II was very familiar with the "views" of Karl Lehmann and Walter Kasper when they were named Cardinals last year. Again, does true loyalty mean remaining silent or, much worse yet, making excuses? Or is the proper Catholic response to question what's going on? "What the French Revolution was to France, the Second Vatican Council was to the Catholic Church." "There is practically no liturgy worthy of the name in the Church." Finally, the Novus Ordo required an additional "foreword" published one year later which justified the doctrinal orthodoxy of the Mass. The existence of this "justification" is the most condemning aspect of all. Why is such a justification needed if the orthodoxy of the Mass is so clear? And, as with all the other excuses and defenses of this new orientation, the very fact that they exist is an implicit acknowledgement of the legitimacy of criticism. "Traditionalists view the Mass of Pope Paul VI as significantly 'different' than the Tridentine Mass." Here we come to the second "mysterious objection". Again, traditionalists are accused of a position held partially or totally by those same Church leaders they are supposedly being disloyal to. It is well-known that one of the main objectives behind the "revision" of the Roman Rite was an "ecumenical" one. It was to break down one of the chief differences between the Protestant forms of Worship and the Holy Sacrifice of the Mass. While the validity of the sacrament may not be up for debate, the prudence of the decisions supporting the revision (revolution) of the Roman Missal is not beyond questioning, especially given one of its chief objectives. 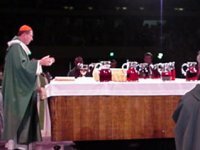 If one objects to the current ecumenical direction and practices which humiliate the Catholic Faith and cost countless souls, why should the Novus Ordo Mass receive immunity? "Hoc Est Enim Corpus Meum"
The "Preparation of the Altar"
"Traditionalists are on a trajectory towards or leading people into disobedience and schism and are no better than liberal dissidents on the left." While it's heartening that some "conservatives" realize they cannot pronounce someone "Schismatic" just because they don't agree with his views on successful pastoral techniques, it's not much better when they try to use an imaginary slippery slope. It's unfortunate that the views of traditionalists (the same views universally held by Catholics several decades ago) are now on the "fringe" of the "mainstream" Church, but it's unavoidable. This is not a place traditionalists themselves have traveled but where they have been forced in light of the current Church orientation. Different saints throughout history have found themselves at odds with the popular opinions held by Churchmen, but have remained as such to avoid the even greater error of compromise. 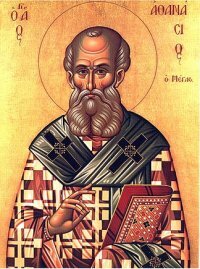 St. Athanasius may be used as a justification for too many things, but one cannot deny that he was better off being at odds with a majority of those "within" the Church than denying his Faith. To go along with the popular opinions just because they are popular is a significant error, especially when dealing with the Catholic Faith and salvation of souls. To say that those Modernist ideas condemned as heretical and dangerous at the beginning of the century are now acceptable because the Pope seems to "say so" is to surrender based on the odds. That truth and error can be defined by public opinion is not Catholicism and is wholly detestable. Furthermore, comparing "Catholic" liberals (material Protestants and heretics) who campaign for Church "acceptance" of baby-killing and "ordination" of women to traditionalists who uphold the consistent Truth of the Catholic Church is extremely insulting and inaccurate. It is a difference of night and day, black and white. Liberals reject encyclicals that aren't in line with their "lifestyle choice"; traditionalists ask clarification on only those items which apparently contradict past teaching. Liberals condemn the spiritual and moral authority of the Church; traditionalists uphold and defend it. Liberals want to promote personal or political agendas; traditionalists don't want those agendas anywhere near the Church. 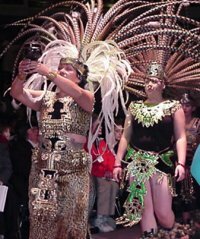 Liberals push for new beliefs, approaches, philosophies, practices and rituals; traditionalists protect the old ones that have sustained the Church for thousands of years. Liberals see the Church as an old-fashioned discriminatory institution of which they are ashamed; traditionalists would die to defend it. Liberals would just as soon leave the Church for a trendy alternative if they don't get their way; traditionalists will remain until the end of time. Just because our current leaders are less sympathetic to traditional Catholic beliefs and practices does not put us on the same level as those who would "renew" the Church according to their humanist and diabolical desires. The fundamental difference is obvious. The dissidents on the left who were rightfully shunned a half century ago have seen their ideals (religious liberty, collegiality, ecumenism) gain great measures of support in the Vatican. Will today's dissidents who proclaim their new causes (women's "ordination", "choice", contraception) gain some measure of official support fifty or a hundred years from now? The Church making any concession to these "causes" seems unthinkable, but no one ever thought eighty years ago that an ecumenical council would release a document affirming the "right" of an individual to publicly profess a false religion. No one thought the Vatican would support or even acknowledge a global, atheistic, man-made institution that aggressively spreads abortion and contraception to all the countries of the world. No one ever thought a Communist government would be so much as tolerated, much less praised in an attempt towards "dialogue". As is the case during every widespread Church crisis, those holding firm to the Catholic Faith are subject to ridicule and persecution. Traditionalists expect nothing less. "Whoever wishes to be saved, needs above all to hold the Catholic Faith; unless each one preserves this whole and inviolate, he will without a doubt perish in eternity." The traditionalists of today were the conservatives of fifty years ago. Their positions have not changed — the Church around them has, and the results are there for everyone to see. "Conservatives" claim a greater degree of "trust" in their leaders whose opinions and actions have received stark criticism from the prophetic words of former Popes. Of course, a "trusting" road is a much easier one to travel. Bearing in mind the ridiculous state of the Church in America, it is natural to cling to the hopeful idea that there are allies in Rome who are "on your side". And if those leaders only knew the extent of what was going on or were not too busy with more important matters, surely they'd come to the rescue. Wouldn't they? "Conservatives" would dread having to get down on their knees every night worrying what the Pope is going to do or say next; or how many potential converts are being lost due to the ecumenical shenanigans; or how an orthodox priest will ever be able to make it through a seminary without getting expelled for being too Catholic; or what type of man a College of Cardinals which includes Mahony and Kasper will elect to succeed John Paul II. I, for one, would love to sleep peacefully each night comfortable that, as bad as things may be in my local parish or diocese, the majority of the Church (and especially the leadership) is composed of perfectly wise and holy individuals, incapable of error. But that's not the case — and maintaining such misguided "trust" is not being honest. "The two opposing camps are now clearly marked; each man should choose his own. Men of good will and men of evil will face one another. The uninterested and the cowards face their fearsome responsibility. They will have their names changed if they do not change their behavior: they will be called traitors." It is completely backwards to fight against the destruction of a cathedral building while ignoring the actual Church in a state of ruin. It is ludicrous to share in the Vatican illusion of a "Springtime of Vatican II" when all eye can see is a devastated vineyard. Catholics must never give in to compromise or ignore error out of a false sense of loyalty. We must avoid the errors of those who fall into "conservative" relativism out of a fear of "private judgment". Our Sensus Catholicus cannot be abandoned or suppressed at the time when it is needed most! Lest I be accused of quoting out of context, Cardinal Ratzinger also says in the letter that "You may not, however, affirm that the conciliar texts, which are magisterial texts, are incompatible with the Magisterium and with Tradition." Which has little bearing on an infallibility discussion, but does come into play when traditionalists make strong affirmations and accusations (even though Ottaviani repeatedly did) rather than pointing out inconsistencies and asking for clarifications. J. Ratzinger, K. Gamber, "The Reform of The Roman Liturgy"
A. Ottaviani, "The Ottaviani Intervention"